We go to Walt Disneyworld on Friday — that’s only two more sleeps away! Which means I’ve been packing. My suitcase is most of the way there, stuffed to the brim with enough shirts for a trip three times as long (I like to layer my tank tops…also I really like tank tops) but I have to make sure my carry on for the airplane is all set, too. My Animal Kingdom Bag. It’s a little small, but I like to use this as a park bag, so I keep it on hand on the airplane. It can fit quite a bit inside of it, and I’ll have our tiny suitcase for things I like to have on the plane that I won’t be using during the flight. NOOK. Having a Nook has been really handy for trips. I can buy books, load library eBooks, and basically carry a whole library to suit my reading whims while I’m in that metal tube for a few hours. 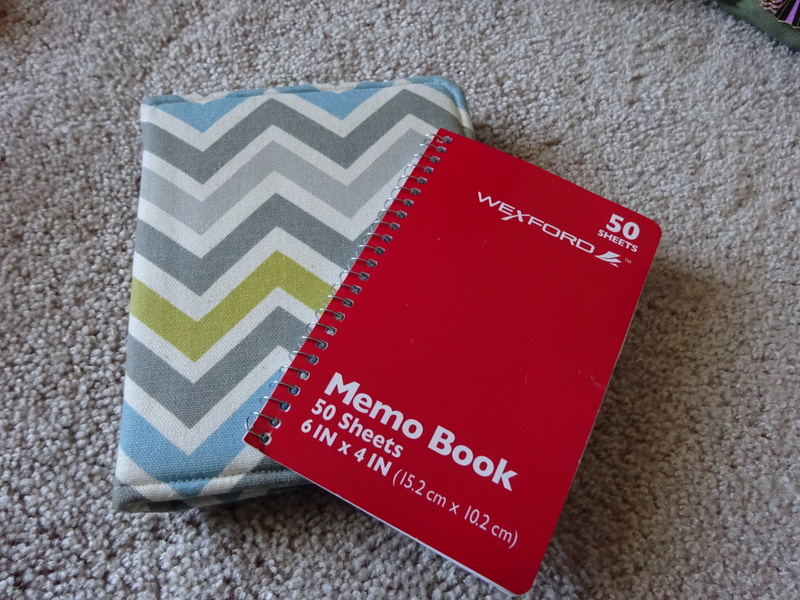 Notebook. Gotta have one of those! NaNoWriMo is coming up, and I’ll be behind when I come back, so I want to get as much of the plot hashed out as possible, and I may need to write some of the story by hand. Water Bottle. 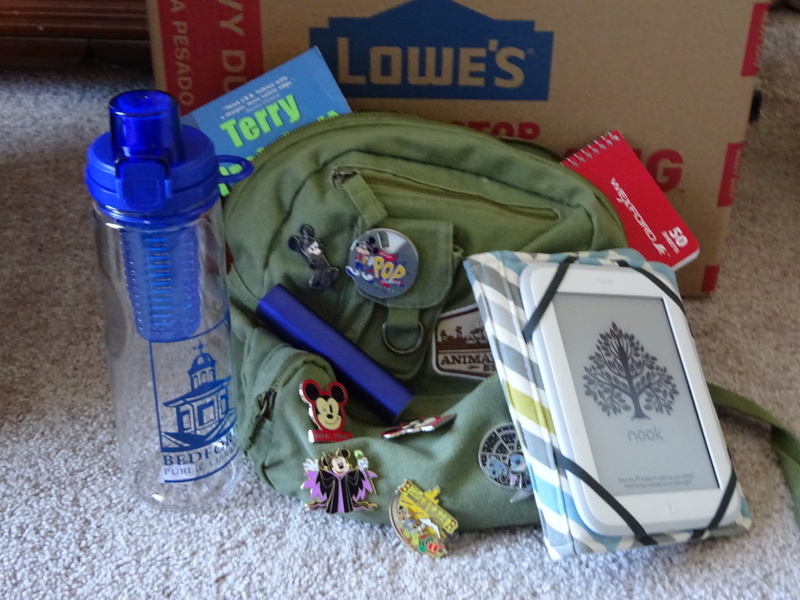 This is also more specifically for toting around the parks, but a Hank Green video also gave a good tip about bringing an empty water bottle through TSA and filling it up at a bubbler once you’re in the terminal, so you don’t have to buy expensive bottled water before boarding. My Personal Pharmacy. Not pictured. But, my husband and I have a history of feeling…ill…on the first day of a trip (traveling, dehydration, lack of sleep…hooray!) so I’ve got my ibuprofen and a whole slew of stomach meds packed away. I’ve also got my sunscreen so I can shield my pasty, pasty skin after we land, and hand sanitizer since other humans are disgusting. My Phone. Duh. But really, I use this for podcasts, audiobooks, music, games…it’s an entertainment necessity. Portable Battery. New addition! On our last trip my phone konked out before the end of each day. While I won’t be using it for pictures this year (yay new camera!) I still want to use the Disney app and creep on Twitter if we’re stuck in a line. Plus that first day, we likely won’t be able to charge our phones after playing podcasts for 3 hours, so we’ll need to keep the phones alive somehow. So, is this overkill for a flight? What do you stuff in your airplane bag? The Good Stuff, a Youtube channel sponsored by PBS that I occasionally watch, is doing a series of episodes on the future of food. Right now they have two videos, one on making meat from plants and one on eating bugs (both are far less gross than they sound). They’re really interesting, and now I want to try a Beast Burger. Did you know there’s a whole population of feral cats that live in Disneyland in California? I did. Did you know that there’s a Cats of Disneyland twitter feed that someone updates regularly? I didn’t. But now I do. Now I do. If I choose to nap in the middle of a sidewalk, that land should be closed to the public in order to let me sleep in peace. The Stuff Mom Never Told You podcast had an episode on borderline personality disorder. They’ve done a few on different mental disorders, like OCD, and I always find them fascinating. These things are so poorly portrayed, education on them is not good, so it’s nice to listen to something talking about them intelligently and sensitively, and it reminds me not to default to “insane” or “crazy” when talking about how a person is acting, and to not blame someone for being ill since they probably can’t help that behavior. I also enjoy learning about how the human brain works. There’s some cool stuff I’ve found. What do you think? And what have you found around the Internet and the world at large? A little while ago, being someone who suddenly decided to get into podcasts but sick of not having an easy way to find them built into my listening device, a.k.a. 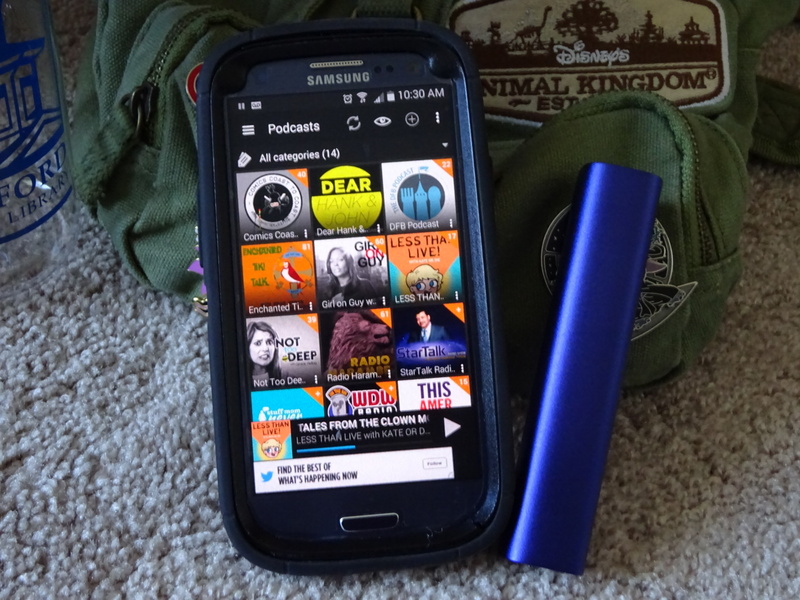 phone, I dug up an Android app — Podcast Addict — and started digging around. What started with me just wanting an easy way to listen to This American Life and some random nerdy stuff turned into a whole page of subscriptions that keeps growing. Here are three of my favorite things to listen to, in order of how they show up on my list. Dear Hank & John. Hank and John Green, whose videos got me into Youtube, started their own podcast shortly after I began devouring them. It can be funny, but mostly it’s deep or just interesting, and it’s fun to listen to them go back and forth rather than in their separate videos. Enchanted Tiki Talk. Three dudes talk about Disney World. 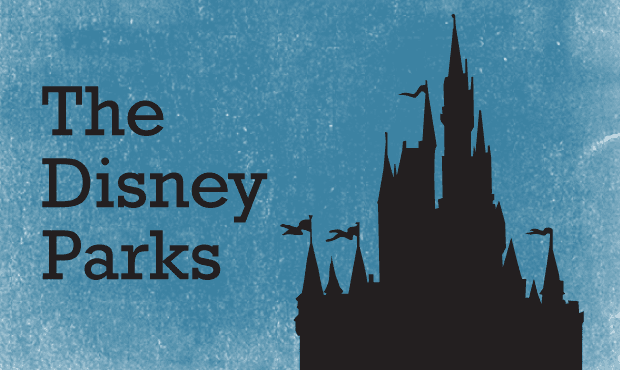 I started to get into this one more over WDW Radio because they seem like only slightly older versions of me and my friends, and as much as they love Disney World they tend to take a realistic look at everything, which I appreciate. Also they talk about the food a lot, so yaaaaaay. Stuff Mom Never Told You. This funny and infinitely fascinating feminist podcast has taught me about transgender and bisexual people, female carpenters, OCD, and dad bods (a day on the internet I totally missed). I don’t listen to every new episode, but I’ve gone back over a year through their catalogue to find some really interesting stuff I didn’t even know about. Do you listen to Podcasts? What are your favorites? Any suggestions for a nerdy feminist lady who loves cartoons, comics, and food? Let me know!